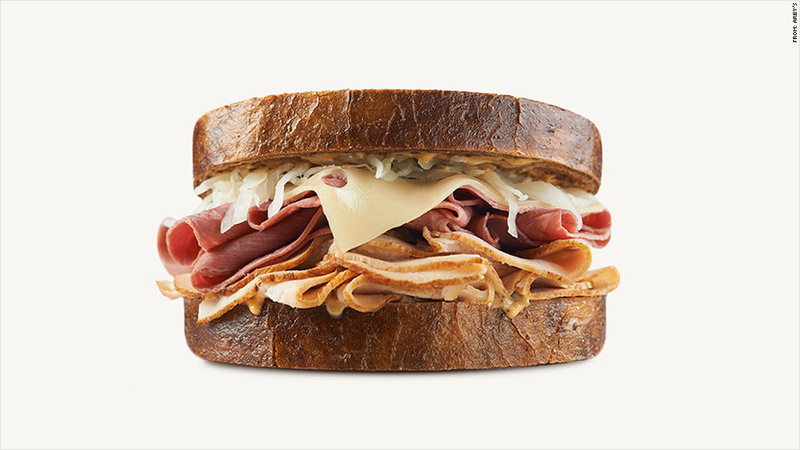 Arby's new Reuben Super Stack is about twice the size of Arby's regular Reuben. Fast-food restaurants' push for protein has led Arby's to offer the new Mega Meat Stacks. The roast beef sandwich chain is introducing meat sandwiches that are at least twice the size of regular versions. The limited-time offers include a Reuben Super Stack featuring corned beef, turkey, Swiss cheese, sauerkraut and Thousand Island dressing. There's also a Triple Stack with turkey, roast beef, pepper bacon, lettuce and tomato. Each of the new creations will cost $5.49 each, averaging about 50 cents more than Arby's regular sandwiches. Arby's is responding to two big industry trends -- more protein and extreme sandwiches, according to Mary Chapman, the director of product innovation at Technomic, a fast food research company. "This is an in-your-face way of saying to the public: look what we've got," said Technomic's Chapman. The new Mega Meat Stacks are being touted in a TV ad campaign featuring tough-guy actor Ving Rhames. The chain is trying to distinguish itself in a crowded fast-food field led by McDonald's (MCD). Arby's had $3 billion in sales last year, while McDonald's had roughly $30 billion in sales.